The airplane has 8 antennas and the Wing Tip Mounted Nav antenna is the last one I have to deal with. This is a very unique antenna designed by some rocket scientist, but if you set it up right its supposed to work pretty well. The benefit is that it is inside the wingtip and functions as both a VOR and LOC antenna. The external antennas that provide this function are big and ugly so this antenna fits the RV quite nicely. Plus gives me full IFR ILS Approach capabilities. I am putting the antenna in the right wingtip so my focus was on this wingtip all night. I riveted the antenna into the nutplates that secure the wingtip to ensure a ground contact with the airframe, also I added the heat protective cover for the HID landing light. After initial set up I installed the landing light and positioned it as best I knew how at this time. I will have to do some testing with the tips on the wing to make sure it lines up right. Also, ran the wires own the leading edge of the antenna as indicated in the instructions.. I used the heat protective tape to secure the Nav/Strobe wires which will secure them as well as protect them from the heat of the landing lamp. With all wires connected and secured I mounted the wingtip and tested it out. Everything for this wing tip functioned as planned. I will secure the antenna with tape initially for test flying, but once it is proven I will run some fiberglass over the tail and some of the antenna mid sections to keep it secure to the bottom of the wing tip. As I start working my way out to the wingtips, I decided to get the flaps in place and rigged correctly with the ailerons. This will help make sure that when the wing tip gets installed I can verify a straight line down the trialing edge of all surfaces. The only remaining items I had on the ailerons was to ensure they were both straight down the chord of the wing and install aileron stops. Vans gives you some instructions on using tooling holes to line them up with the wing chord so I made sure they were both perfect. For the Stops, I went off plans as many others have done. I used a 5/8 inch nylon bushing around the bolt in the hinge, which hits the aileron support angle and works effectively as a stop. After drilling out the bushing to fit, I installed and finished torquing the ailerons. Then on went the flaps, making sure they were in alignment with the ailerons at the same time butting up smooth to the fuse. Everything is now in line and I secured the flap hinge pins in a unique way which I talk about (here) in a prior post. Also, I torqued the rear spar bolts and installed cotter pins. Now its time to focus on the wingtips this weekend. Here is a pic of the nylon bushing that I used as my aileron stop. When deflected it hits the aileron support and stops the travel at the correct location. 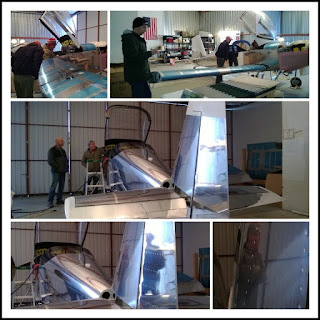 I have been continuing to wire the wing roots, and started torquing the fuel lines.. Here is a pic of the left wing root.. At this point both wing roots are wired up including Pitot and AOA lines. I even kicked off the Pitot heat and verified the Pitot tube function. Working like a charm and with the VP-X I can see how many amps its taking to heat the tube.. The Dynon Tube kicked off at 8 and fluctuated broadly back and forth to about .5 amps. It has an internal sensor that tells it when to shut off so that it isn't constantly pulling amps. Also, I took it slow and started torquing the fuel lines. Making sure no wires touch the fuel lines and all is torqued per spec. I have all my lighting in the tips and tail coming through the left wing root. I spent a couple hours yesterday hooking it all up and testing it. Shot a quick video when I got the tail to react appropriately to the switches. I like the LED lights, they seem to be bright and are definitely easier to install than a standard strobe system. I chose not to sync the tail with the wings, so it will flash independently, but both wings will be flashing at the same time. Lots of progress this weekend. Started with a plan to have a friend meet Bekah and I at the hangar to help get the wing on. I thought through as much as I could ahead of time and with the 3 of us and a 4th that showed up last minute we got the wing pined on with drift pins really easily. I then rubbed some Boe Lube all over the NAS bolts and while Bekah lifted the wing tip to unload the bolts, I drove the first (an upper) one in with a rubber mallet and no issues at all. Then I tried to drive a lower bolt and it was so close to the floor that I hesitated, plus it wasn’t going in so well.. Then I was loaned a short rivet gun. Bekah again unloaded the wing by lifting the tip and the rivet gun helped slide the bolt right in. Was crazy how smooth it went in by smacking it with a rivet gun. Then I spend the rest of the day working the wiring in the wing root and hooking up the fuel lines etc. At this point, the right wing is pretty well in place now.. Time to move to the left.